Celebrate love with Elsa and Anna! This super-soft bedding set features your favorite sisters from Frozen! 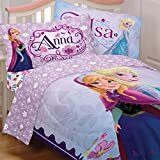 The front of the comforter features Elsa and Anna holding hands on a purple background. The reverse side is covered in a beautiful array of flowers on a white background. For even more Frozen fun, add wall accents and stickers of Anna, Elsa, Olaf, and other characters (sold separately). … CONTENTS: One twin size comforter 64 x 86 inches (163 x 218 cm). ; One twin flat bed sheet, finished size 66 x 96 inches (168 x 244 cm). ; One twin fitted sheet. Both of the above fit a standard twin mattress of 39 x 75 inches (99 x 191 cm). ; One standard pillowcase, finished size 20 x 30 inches (51 x 76 cm) to fit a 20 x 26 inch (51 x 66 cm) pillow.